With over 20,000 respondents for this year's survey, the Employer of Choice Survey 2018 remains Africa's number 1 choice to answer your questions on employee engagement and employer branding across the African continent. The Careers in Africa Employer of Choice Study sees seven of last year's top 10 once again in leading positions. If it's variation you want, though, looing furher down the list of brands and digging into the attraction and engagement drivers that support the ranking will reveal some big changes. This image clearly shows how the average person's confidence in their leaders differs though Africa in 2018, according to our Employer of Choice survey. 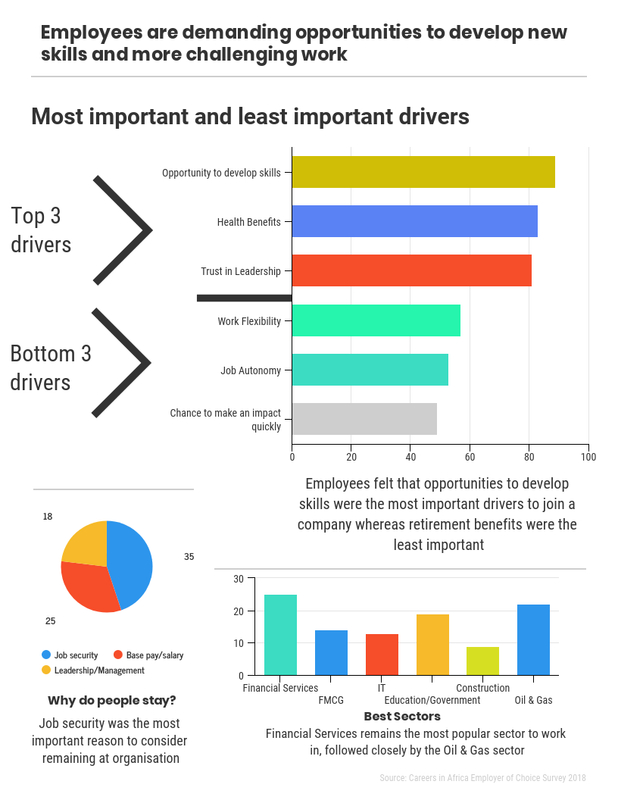 These graphs and pie chart created from the data gathered in our 2018 Employer of Choice survey, clearly show the factors that people in Africa currently value most in their jobs. 2018's Employer of Choice survey showed us that women working in Africa value flexibility in the work place more than men do, this graph allow us to see the reasons why. Please follow the link below to read the full article inspired by the Employer of Choice survey in 2018. This article was originally published in African Business Magazine.